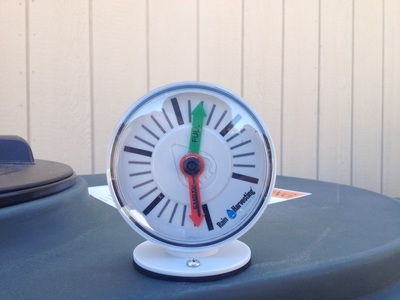 Need a reason to collect rainwater? 1,000 gallons up to 5,000. GSL provides an integrated approach to landscape and rainwater harvesting!!! 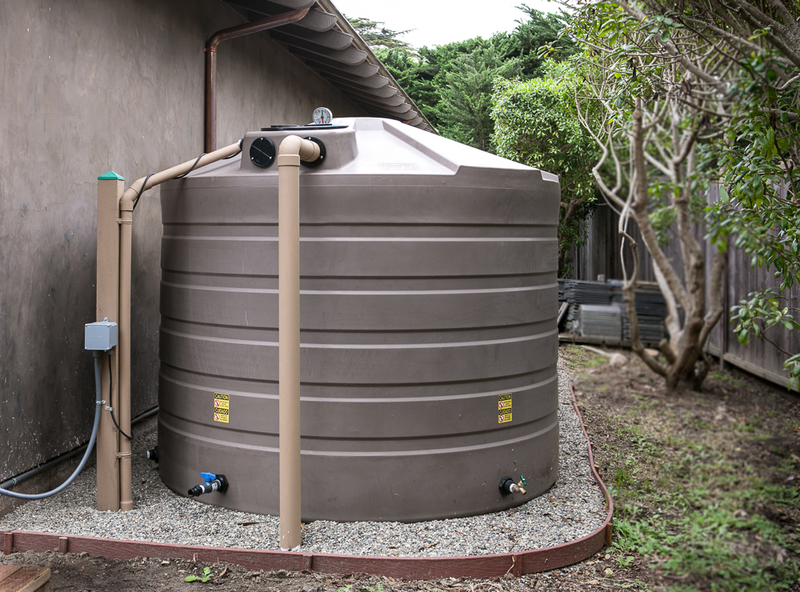 The Monterey County Resource Management Agency has has a draft of new guidelines called the "Rooftop Rainwater Harvesting Permit Application & Inspection Checklist". They are currently taking input on this document before finalizing it. 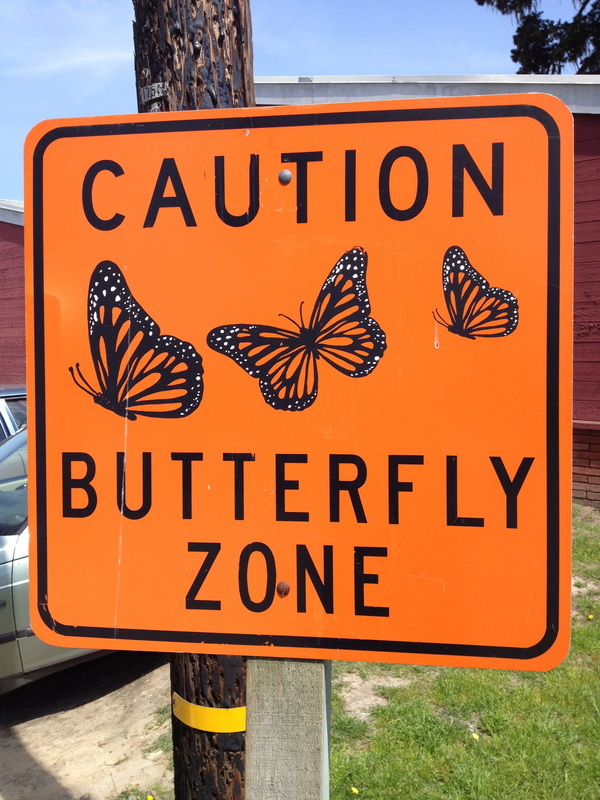 This would define when and if a permit is required. To read the text click here. Monterey receives about 21 inches of rain during an average rainfall year. The past two years have been below average and the previous two before that were above average. As of July 2015 weather forecasters believe an "El Nino" year will bring significant amounts of rain this upcoming winter. 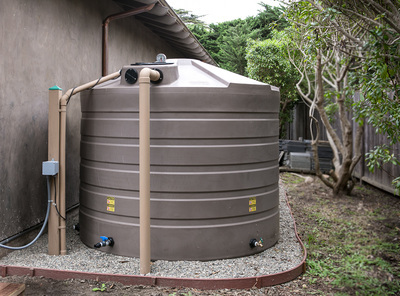 Rainwater Harvesting in the south western part of the United States is unique compared to the mid-west and eastern areas of the country. Local areas receive rainfall during the winter months and we need to store it for use in summer months. Other areas are typically snowed in and landscape is hibernating and many of these areas may experience sub-zero weather. These areas receive rainfall during the summer mostly and collection cisterns can be sized smaller because of the frequency of rain events during the usage period. Here we have to store up everything we receive in the Winter for use in the Summer. The following graphic shows the distribution of rainfall and temperature during an average year. The following rainfall data is taken from the U.S. Climate Data Website. Average rainfall data was collected from 1981-2010. Reading taken near Walter Colten Middle School in Monterey. Average rainfall per year = 21.16 inches. Data Collected near Chaucer Drive in Salinas. Average rainfall per year = 15.47 inches. 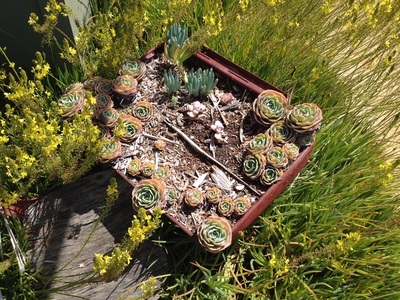 Data Collected near Ford Road in Carmel Valley Village. Average rainfall per year = 19.37 inches. The following stories are examples of our work. For more click on "Projects" above. This is a 10,000 gallon installation in Carmel. 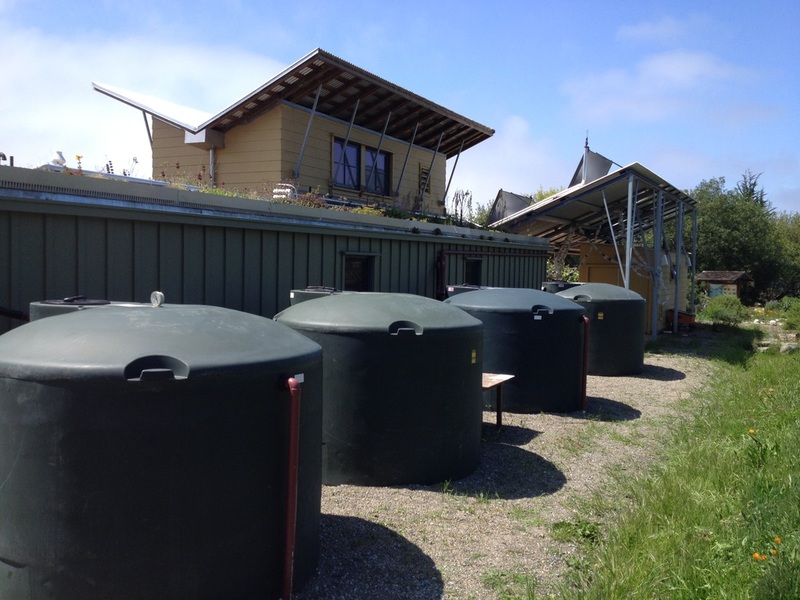 The tanks are connected to 5 downspouts catching rainwater from approximately 2,400 square feet of roof. With 8-9 inches of rain the tanks will be full. This system uses 5 downspout filters, an in-ground 18 gallon first flush, and a floating extractor for the pump to suction water 8 inches below the surface where it is very clean. The rainwater will be used to irrigate landscape around the home. GSL installed a stable base made of 4 inches of base rock and two inches of decomposed granite compacted. 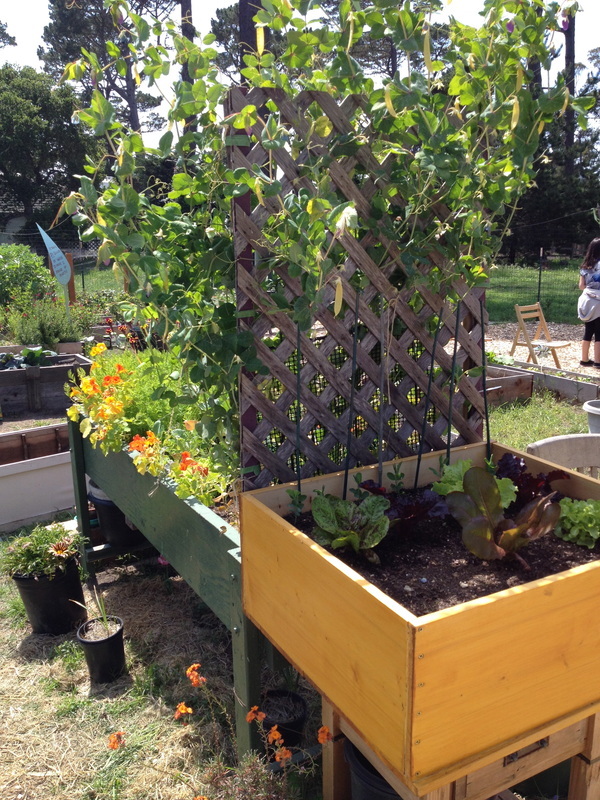 Click on Carmel-ADM to read about and see project pictures. Garden Solutions Landscaping installed a 5,000 gallon Bushman mocha colored tank in this backyard. 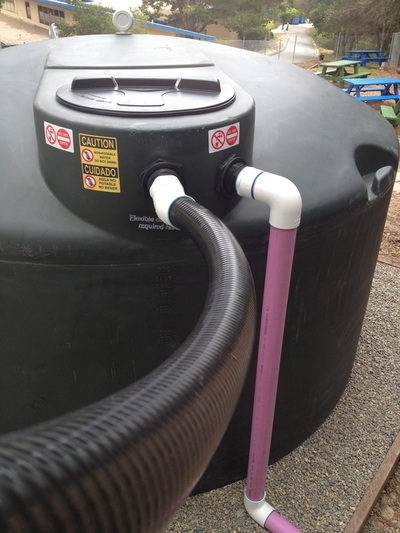 The rainwater is used to irrigate landscape around the house using a Grundfos pump. For more information click here. 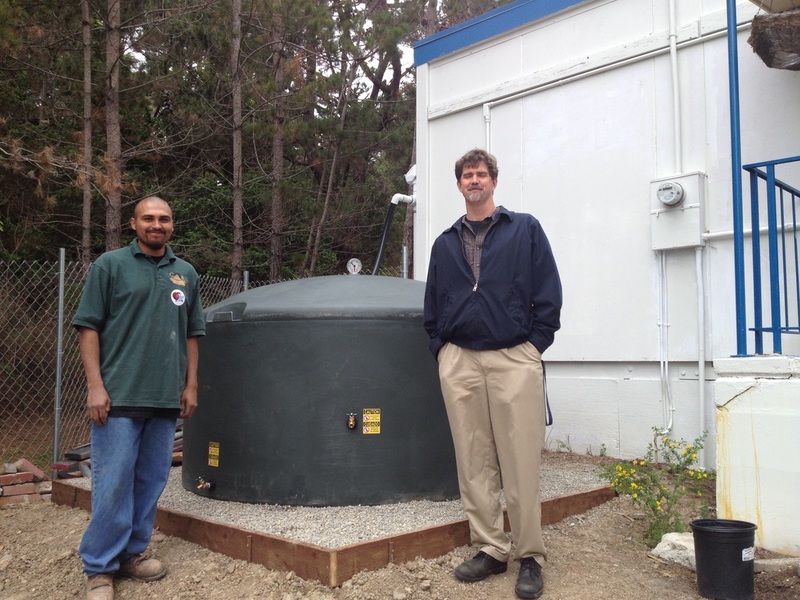 Garden Solutions Landscaping completed installation of a 6,785 gallon rainwater system near Asilomar in October. Water is collected from 5 downspouts around the garage draining through a 4" underground pipe to a central sump location. The sump pump moves the water into the tank system. Leaf Solution gutter filters are installed on the gutters around the garage as the primary filter. A float switch was installed inside the primary collection tank. When the water level is high the float switch turns off power to the sump pump and water overflows out the sump and into a rain garden where it percolates back into the ground. A large tank was also placed on the other side of the lot. 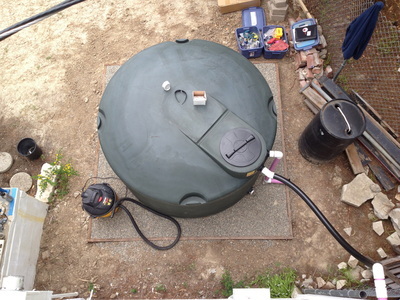 Because the garage roof can collect more rainwater than the capacity of the tanks installed, the irrigation pump can push water through the main irrigation line into the remote tank. When the water is pumped into the remote tank the float switch in the primary collection tank will drop and turn power back on to the sump pump. When it starts raining again the sump pump will move water back into the tanks next to the garage. In the summer when the three tanks run dry, the irrigation pump, designed to be mobile, can be moved to the remote tank and be connected with the same suction and pressure hoses to the same in ground irrigation line. 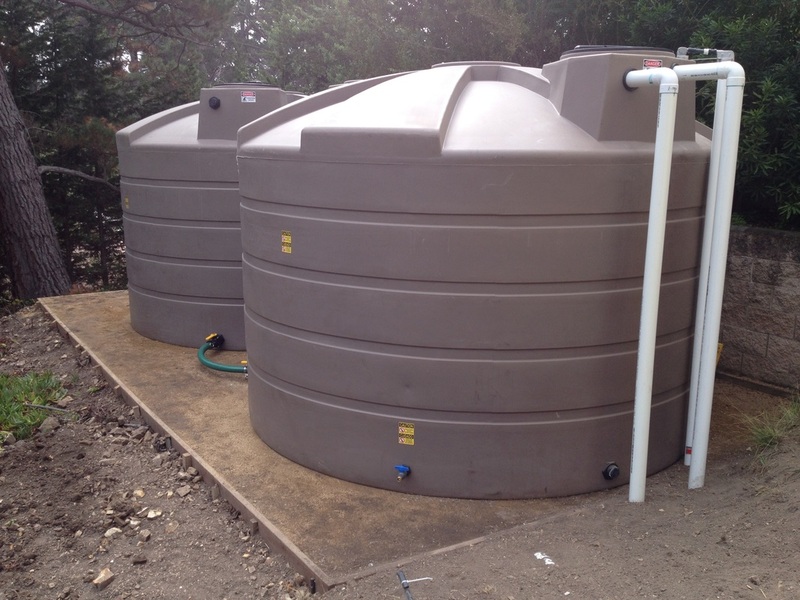 The tanks are made by Bushman and come in different colors the homeowner can choose. In this case a mocha brown color tank was chosen to match the color of the garage wall and a light green to fit in with the bushes and trees. For more information click on Asilomar rainwater system. 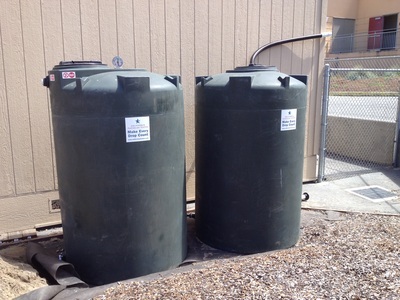 Four Local Schools Receive Rainwater Systems Based On CAL-AM Funding; PG Adult School, PG Middle School, Walter Colten, and MEarth at Carmel Middle School. GSL is proud to have been chosen to design and install the systems! 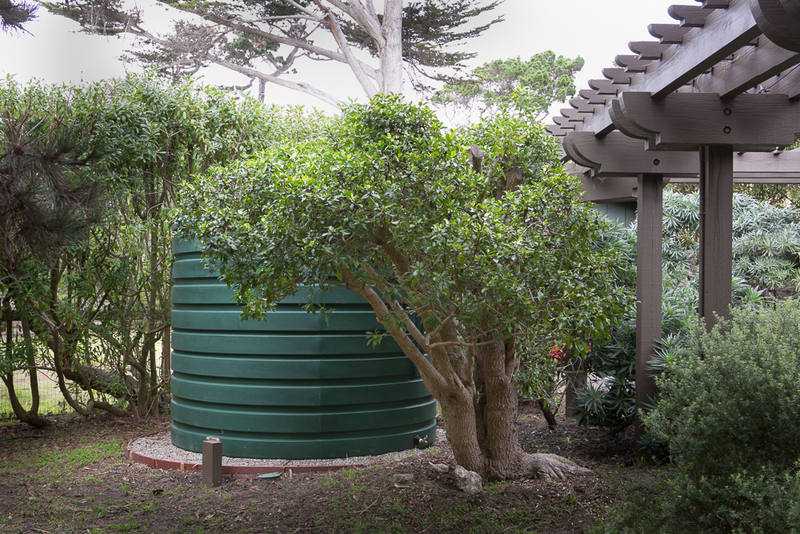 An easy way to blend your rainwater tank into the landscape! Do you want to camouflage your water tank? 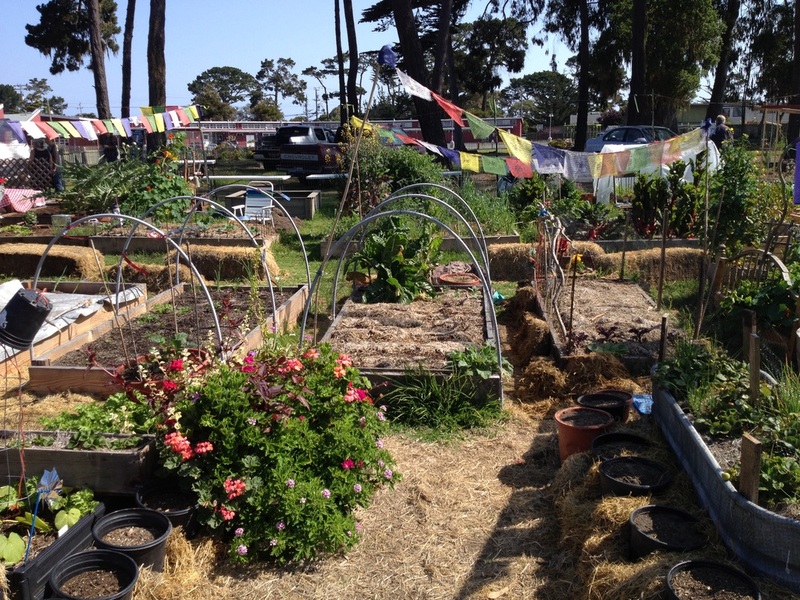 In this case the Monterey homeowner wrapped chicken wire around a 550 gallon tank and filled between the tank and chicken wire with leaves. 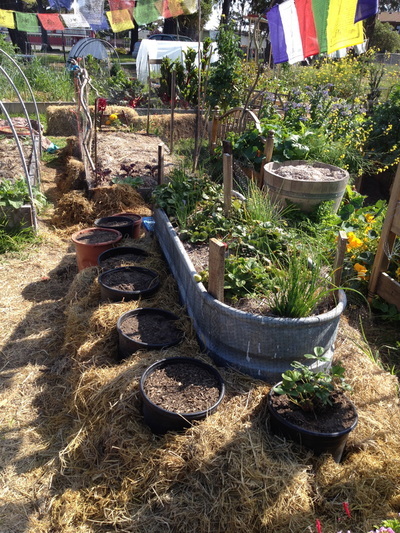 It now looks like a large compost bin. A side benefit is the leaves will insulate the tank keeping the water cool and protect the tank from UV light. 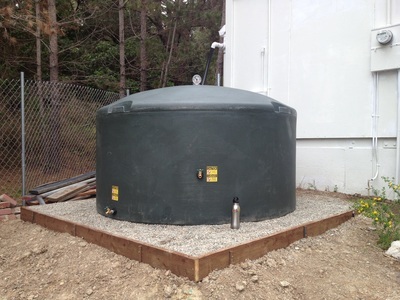 The tank is at the high side of the property so a hose can be connected and let gravity deliver the water. 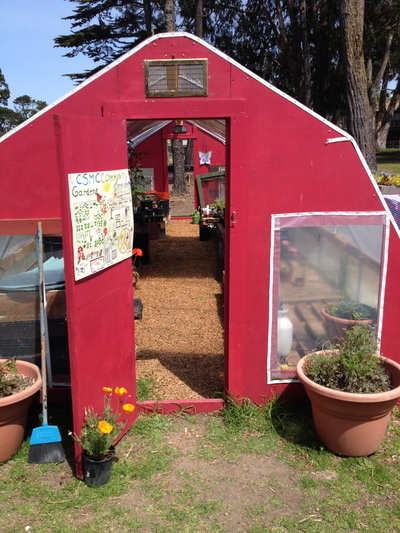 San Benancio Chicken Coop harvests rainwater for its needs! 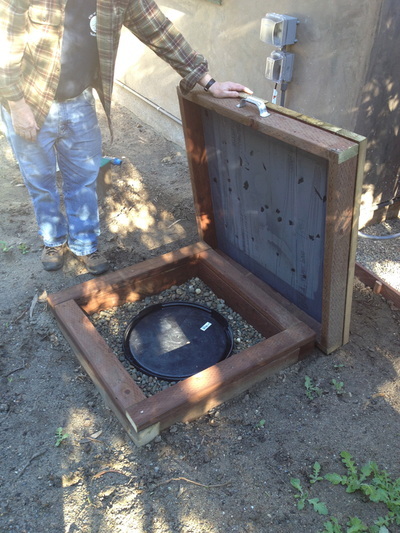 Here is a great example of using rainwater to support the needs of animals. After a discussion with the homeowner about collecting rainwater off the roof of their chicken coop, they installed the gutter, downspout, and rain barrel. The chicken coop has approximately 128 square feet of roof that yields about 1,100 gallons of water per year. Knowing how much water the chickens use per day also lets you set up an automatic drip system based on gravity flow into the poultry waterer. Now their 10 chickens have rainwater through the winter and most of the summer with little to no intervention! Great Job. For more information call Garden Solutions Landscaping to see how rainwater can support your livestock needs! A homeowner in rural Royal Oaks called and asked about installing a collection system to capture runoff from their private driveway. For years they watched a current of water running down the gutter of their driveway during the rainy season. 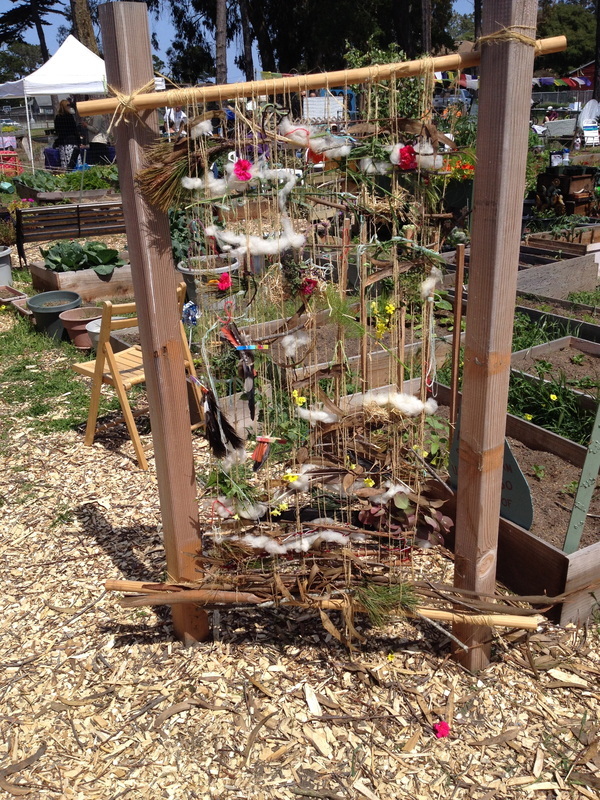 They wanted to capture the water and use it to supplement their well water to irrigate pasture and gardens. Collecting water from different surfaces presents different issues. By definition "rainwater" is water that is captured prior to it coming in contact with the ground. If the water contacts the ground, as in this case, an asphalt driveway, it is now defined as "storm water". Storm water has touched a surface that could be contaminated with hydro-carbons dripping from cars, or pesticides, or herbicides, etc.. Collecting storm water to be used for irrigating gardens may not be a good idea, and most storm water collection systems channel water into bio-infiltration basins where natural filtering of the water occurs. In this case the homeowner's driveway collection surface is used infrequently and cars or other vehicles are not parked on it reducing the chance of hydro-carbons dripping onto it. There are natural grasses growing on each side of the driveway. The homeowner has a flock of approximately 20 goats that roam the sides of the driveway and forage on the weeds keeping them under control. 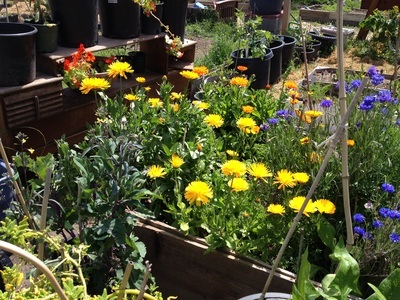 The homeowner advised in the many years they have owned the property no herbicides were used to manage weeds and neither have pesticides been used to control insects or critters. After researching the issues, and storm water products, and discussion with the owner about pro's and con's, a decision was made to proceed. The installation would include cutting the curb and sloping the driveway to channel the water into a GRAF Infiltration Filter Shaft. The GRAF device has a drain grate pictured above and two basket filters that sit below the grate and capture debris and sediment that enter the system. The filtered water is then channeled via gravity to a 2,600 gallon tank where it can be distributed for irrigation. The system was installed after the rainy season and the homeowner should have a water sample tested after the first rainfall of next years rainy season to understand specifically what is being collected. It can then be determined how broadly the water can be used. 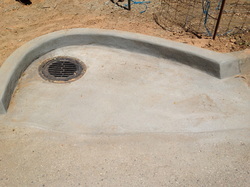 For more information on the details of this installation click here (Stormwater system). Click here to check out my visit to the McDowell Sonoran Preserve in Arizona. Click here to check out my visit to the Columbia EcoVillage in Portland, Oregon. 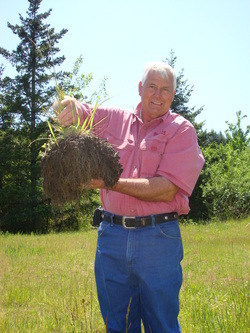 Billy Kniffen - Known throughout Texas, Billy Kniffen has served in the Texas Agrilife Extension (part of Texas A & M University) for 29 years. In his current position as Texas AgriLife Extension Service Water Resource Specialist he has statewide responsibilities that focus largely on rainwater catchment education. 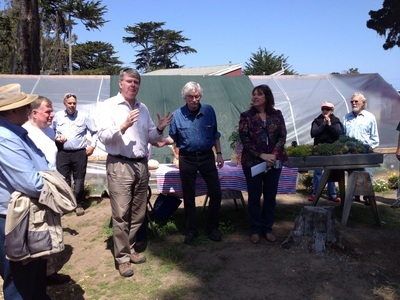 During his career, he has served as a director and education coordinator for the American Rainwater Catchment Systems Association. He also helped organize the Texas Rainwater Catchment Association and served as its first president. Mr. Kniffen is a TAMU Board of Regents Fellow Service recipient. He and his wife Mary live in Menard in a home solely dependent upon rainwater. Want a great reason to collect rainwater? How about these pictures showing a beautiful raised bed vegetable garden!! All the fresh vegetables you want spring, summer, and fall. 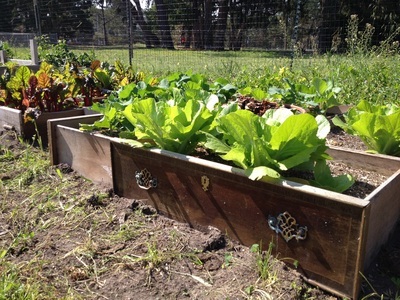 The owners of this Carmel Valley home have installed two 1,500 gallon rain tanks in January 2010 and are now enjoying the payoff with fresh vegetables every day. As of the beginning of July only about 20% of the water has been used, leaving plenty for the balance of the summer and fall. The water is brought to the garden from the rain tanks via a Grundfos MQ3-45 compression pump. 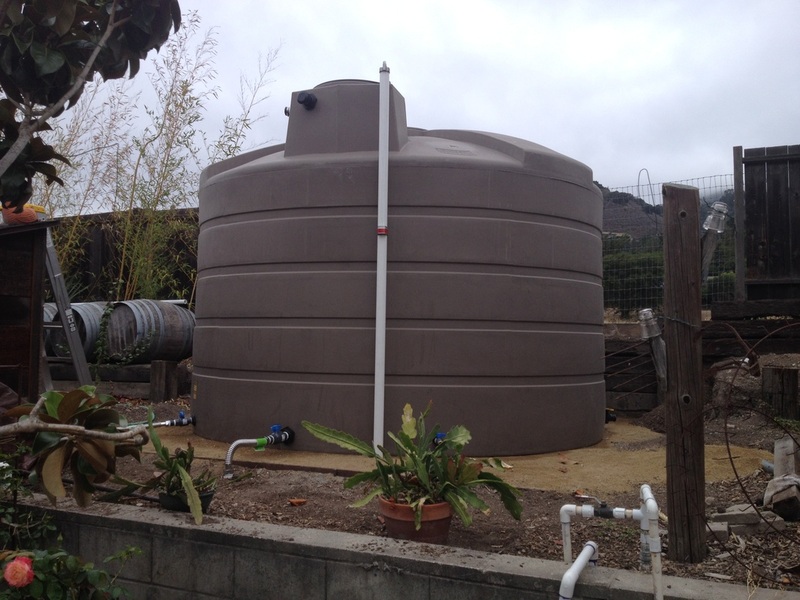 Click on the following to see the full rain water tank installation. Concerned about water availability or the cost of water? 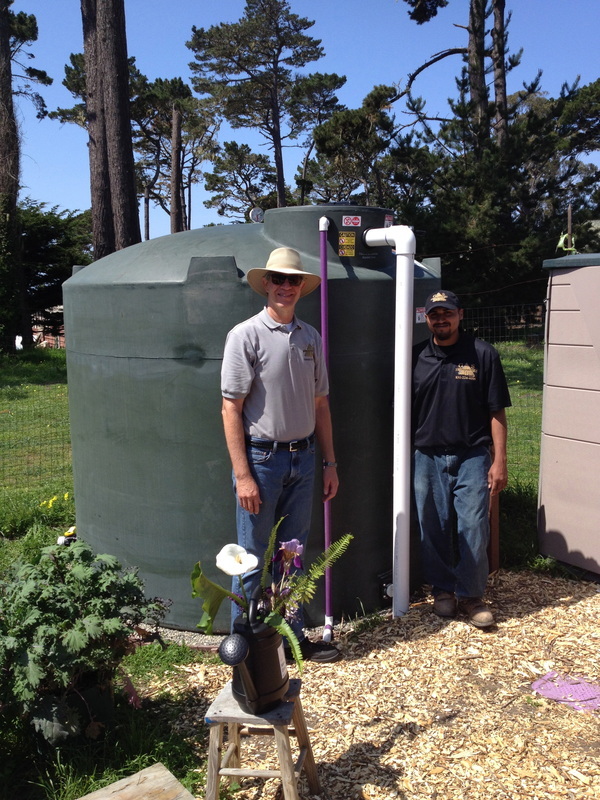 Central Coast Rainwater Harvesting was started in 2009 by Roger Manley to educate and consult on rainwater harvesting systems on the Monterey Peninsula and surrounding areas. 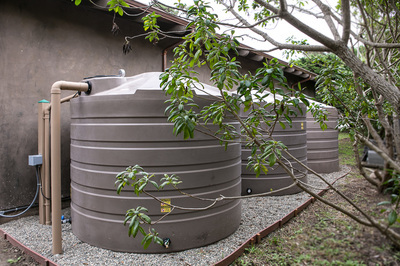 Rainwater harvesting is the collection of rain from a "catchment" surface for irrigation, livestock, wildlife, washing cars, or in-home potable and non-potable uses. Catchment surfaces are typically roofs, parking lots or driveways. 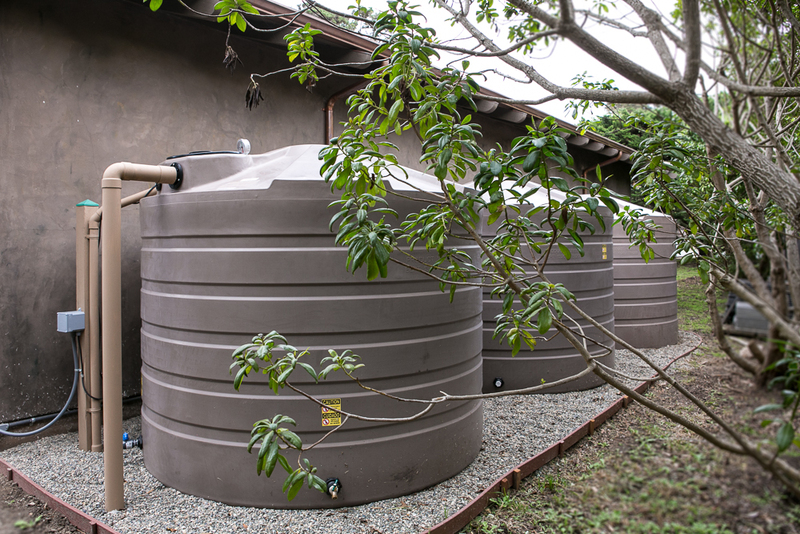 Rainwater can be harvested and stored in tanks for later usage, or directed into landscape areas to improve the health of the soil. 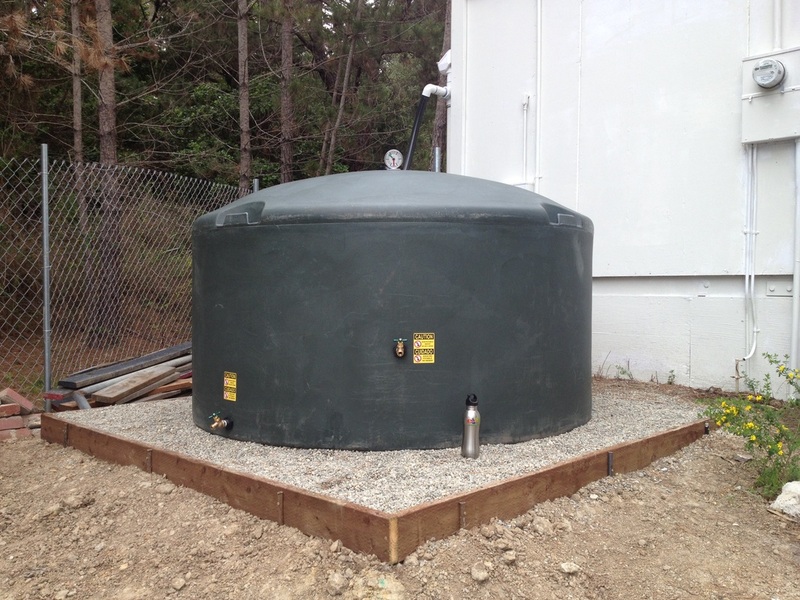 From a storage tank, rainwater can be delivered via gravity or pump to its intended destination. Water on the Central Coast has been tenuous at best and conservation measures taken by consumers make us some of the most efficient users in the country. Current desalination proposals being reviewed will provide more water, but at what cost? Desalinated water will cost almost 10 times as much as it currently costs to pump water out of the Carmel River and use a significant amount of power generated by fossil fuels further exacerbating the amount of carbon dioxide being pumped into the atmosphere. Today in California 19% of the state's electricity, 30% of its natural gas usage, and 88 billion gallons of diesel fuel is consumed annually along the entire water value chain per the results of the California Energy Commission 2007 study (PDF file available for download below). This includes the conveyance, storage, treatment, distribution, and waste water collection. The study concludes the best single new supply of water to support growth over the next 25 years is water use efficiency. In other words we need to take advantage of what we have today more efficiently! Rainwater harvesting efficiently uses water previously directed into storm drains. Need Water? Go to our 'Contact' form above.